The Citadel of the Ho Dynasty comprises the remains of a late 14th-century capital of Vietnam. Prime Minister Ho moved the capital from the vulnerable Hanoi (Thang Long) to this more central countryside location. He also strengthened the position of neo-Confucianism within the state at the expense of Buddhism and Taoism. The city was laid out in harmony with the landscape according to strict feng shui principles. The walls were constructed from large blocks of stone, an answer to the invention of gunpowder in the hostile China. 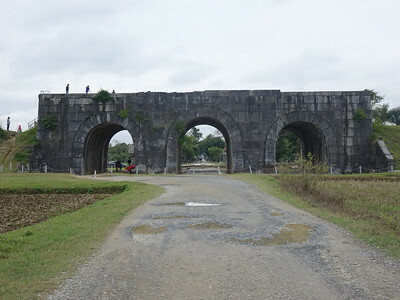 The Citadel of the Ho Dynasty comprises the remains of a late 14th-century capital of Vietnam, built in full harmony with its surroundings following the neo-Confucian tradition. Most information that you will find about the site will be accompanied by a picture of that one iconic stone gate: the South Gate of the Citadel. But there is more to this than just “walls and gates”. The WHS consists of 3 locations around the small city of Vinh Loc: the Citadel, the Nam Giao Altar and a part of the Outer Wall. At least 6 of the 7 reviewers before me seem to only have visited the Citadel and then often even just its South Gate. I knew I had to put more effort into it to prevent a short and unsatisfying visit. From Tam Coc where I was staying overnight, I hired a car + driver to take me to Vinh Loc. It’s only a 58km drive but it took us 1.5 hours because of the heavy traffic and the slow passages through towns of all sizes. Already some 18km before Vinh Loc the WHS is advertised on road signs. In the town itself there are no obvious signs anymore pointing to the citadel, but fortunately my driver had been there before and drove straight to it. There’s an entrance fee of 40,000 dong (ca. 1.5 EUR) and there were some 20-30 other visitors, mostly locals with children. I started my tour at the visitor center, which has a small exhibition of findings from the WH area. Lots of red tiles, nails, coins, some pottery and a quite magnificent Phoenix that once adorned the roof of a Ho Palace. I also bought a booklet there about the Nam Giao Altar. The text came in both English and Vietnamese, which would later prove to be handy for practical reasons as well. The iconic South Gate is the main entrance to the citadel. It can be climbed via a stairway - and that was what most visitors were doing (taking pictures of their loved ones standing on top of the gate). Behind the gate the large inner area of the citadel opens up. It is a square of 1x1km. All 4 cardinal directions still have their original gates and the citadel is fully encircled by a wall. As others have noticed the interior is now in use as agricultural land, which does give you some ´couleur locale´ to look at while walking the long stretch to the other end of the citadel. Only a pair of stone dragons about half-way remains of the original setting. The citadel used to be connected by an Imperial Way to the most sacred place of the capital, Mount Don Son with the Nam Giao altar. Visually, the connection from the South Gate is still there but the stone road has long been replaced by tarmac. To reach the Nam Giao Altar we used my just acquired booklet to ask passers-by for directions. It took us three tries, but we found it: first drive or walk from the citadel in the direction of the landmark Don Son, some 2km away on the other side of Vinh Loc town. The main road splits right before the mountain: take the right loop. After about 500m you will see signs pointing to the left, where you can find the entrance road to the Nam Giao altar. The site lies some 700m further at the end of this road, on a dead end street to the right. The Nam Giao altar is the place where - according to the Confucian tradition - Heaven and Earth met and the king annually prayed for the prosperity of his people, his dynasty and the state. This altar was only unearthed in 2004, after being unused for almost 6 centuries. I don’t think the site was officially open, but the guard directed us straight through the shrubs uphill to the altar. The official entrance has a stone footpath and even an exhibition room, but the fence over there (with neat Unesco logos!) was locked. The altar consists of a succession of 5 rectangular plateaus that gradually become narrower upwards. Completely on top is a round altar that represents Heaven. On the right side of the path to the altar is a large stepwell in which the king cleansed himself before starting the rituals. Although I enjoyed my half-day tour to this still nicely off-the-beaten-track area, I still am doubtful whether the Ho Citadel should ever have become a WHS: its short-lived state as capital of Vietnam is no match for the already inscribed Thang Long and Hué & its Vietnamese adaptation of Chinese Confucian city planning is very much a regional niche aspect. There are similar sites on the List as well: Vat Phou with its processional walkway, Hué with its own (though later) Nam Giao Altar and even the Jongmyo Shrine. 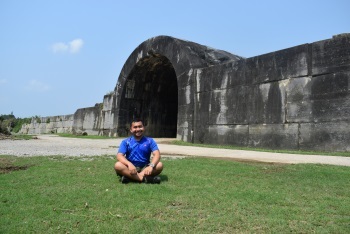 My third consecutive years visiting Vietnam gave me an opportunity to tick off the last two, Ho Citadel and Trang An, to complete Vietnamese World Heritage Sites. Conveniently both sites are located near the city of Ninh Binh, just 2 hours from Hanoi, and many tour agencies offered transportation service. After 4 hours from Hanoi, our driver, who rarely comprehended any English word and relied on google translation app on his mobile, took me and my friends in front of the imposing ruined three arched gate of Ho Citadel. At first glance, the site was extremely underwhelming, there was nothing except the gate in the middle of nowhere of endless rice fields. Fortunately that the gate was really photogenic and the size and engineering craftsmanship of the gate were quite impressive. We climbed to the top of the gate and found beautiful view of sea of golden almost harvestable rice fields, and from the top we could see and understand the citadel square form and its surrounding Feng Shui element of mountain and river. We spend only 30 minutes on Ho Citadel as there was nothing much to see. Its small museum also closed without explanation and we decided not to disturb locals who were harvesting rice in the middle of citadel. 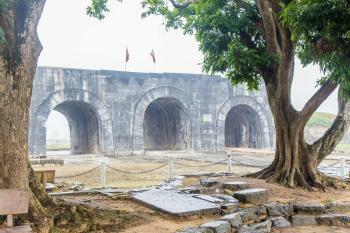 Currently there are 3 citadels in the list of Vietnamese World Heritage Sites, Hue, Ho and Thang Long, the differences of these sites in terms of citadel gate and layout are hardly noticeable, so after have seen Hue and Thang Long, Ho Citadel offered nothing new and made the visit totally not worthwhile. Fortunately that the photogenic gate and the view of golden rice fields saved my visit to be quite memorable. Indeed, this place is off the beaten path and the only way that I could make renting a private car worth it was by combining a visit here with a visit to Trang An - Hoa Lu - Van Long; thus, a 2D/1N arranged trip made ticking off two WH sites possible. Contrary to the other reviews that show only disappointment, I was in no doubt impressed by the relics of the Ho citadel. While it's true that it's really just walls and gates, one has to go the level of architecture and construction engineering to appreciate its unique values. The stones used, for example, are definitely of bigger sizes than from other ancient buildings in SE Asia. The way they were fit together also demonstrated high masonry skills as the stone blocks almost have no gaps between them. It is unfair, in my opinion, to impose high expectations on the site as beauty and "grandness" are not really its strengths. But, the little details I observed, as well as its history, fairly justify its inscription. The rural environment in and around the citadel are also a big plus for the experience. Would I recommend it to fellow WHS hunters? Yes. PS. There is also a conservation centre beside the southern gate where one can see more info about works done on site and findings. The citadel is in a small town called Vinh Loc. I couldn’t find mention of any tours that go there and there is no direct public transport options for other cities where you might be travelling through. In the end, I found a local bus that took 90 minutes from a city called Thanh Hoa, which I was not intending to visit. It seemed like the easiest way, though, short of hiring a car and driver for a day. I guess I was hoping there might be a good payoff for all this effort. There wasn’t. Not with the citadel itself, that is. I appreciate that this is a historically-significant site but the only thing that really remains is the large stone wall, about 900 metres long on each side. It’s an impressive wall and so I decide to walk along it. In the centre is where the citadel’s buildings would once have been. However, now there is nothing left. 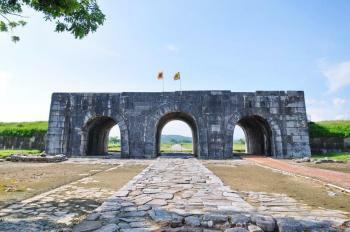 As for me, Ho citadel is one of the most attractive destinations in Vietnam because of its value. I went to Ho citadel for 2 days 1 night with my husband. We spent one full day to explore the Ho citadel, listened to the tour guide introducing about the Ho's history and enjoyed the fresh air with the rice field and lotus pond. Some nice pictures were taken but unfortunately, I lost them. :(. I'll come back there in upcoming time. Make sure. Should you need further information, please do not hesitate to contact me at email kieuanh168@gmail.com. Read more from Anna Le here. This citadel is the latest WHS of Vietnam. I had to try my best to visit there, because no tour operators or public transportation. Finally, I decided to go to Ninh Binh town the nearest point to reach the citadel easiest way. From Ninh Binh, I chartered sedan car with driver drove through many bustling villages for 1.30hours approx. The driver never talked to my friend and me. I known later, he was stress out driving to attraction he may not go there before. The citadel have only a few evidences to prove to be the ancient capital. There are well condition city walls and 4 gates. In the middle is paddy field, lotus ponds and dirt roads. However, I love there. I've found surrounded villages are commune style housing. Quite and simple countryside with friendly farmers and villagers. Vietnam is one of destination are talked about rip-off but not here. People seem not used to foreigners but they are welcome. In the WHS there were only 2 visitors, my friend and I wandering in the walls. Although it have a few ancient things to explore but its history is interesting. You can read the brief and enjoy photos from my blog. This site is in two parts, one each side of Vinh Loc village in the province of Thanh Hoa. The Citadel is almost a kilometer square surrounded by earth and masonry walls. In the centre of each side are masonry arched gateways. The area within the walls is now rice padi. The Nam Giao altar resides on a hillside at the other end of the village. Vinh Loc is accessible by bus from Thanh Hoa town. Stepwells: At Nam Giao Altar location, used as a ritual bath: "a square well with steps, still full of water. It has been identified as the ‘Jade Well’ but is known to local people as the ‘Well of the King’." Phoenix: Large terracotta phoenix that used to feature on the palace roof is on display at the Citadel museum. 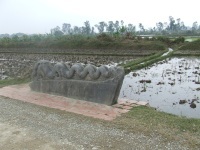 Recently discovered: The Nam Giao Altar was rediscovered in 1980 and unearthed from 2004 on. Northern Vietnam Hotspot: About 60km / 1.5 hour drive from Ninh Binh to Vinh Loc. There is also public transport (bus). Controversial at inscription: ICOMOS recommended deferral. None of Crit ii, iii and iv justified (though ii might be with more work), core and buffer zone boundaries not good enough, no inventory etc. Egy led proposal for inscription ("similarities with Cairo citadel case". Sui, Aus led against. Inscribed!